There’s one universally acknowledged rule all marathon runners adhere to: never do anything new or different on race day. During training, though, it’s good to experiment and learn from your trials and errors, especially when those experiments are conducted during a long run — the bedrock of all marathon training programs that often becomes a dress rehearsal for the main event. But what if a long run experiment is so radical that failure could jeopardize the program and threaten success on the big day? For long run number three, I decided to throw caution to the wind and do something I have never done in five years of marathon training. 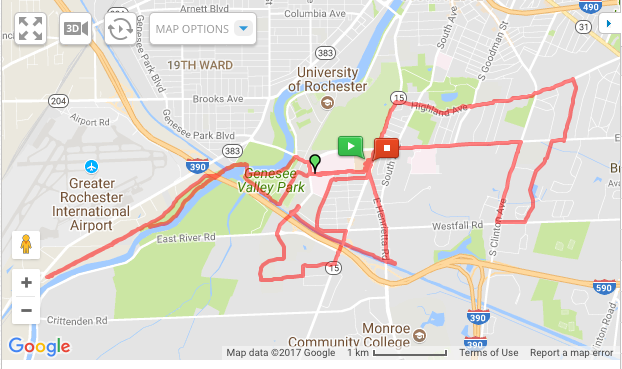 A chance post in my Facebook feed from the Rochester Running Co. announcing a group long run piqued my interest, and after several days of deliberation, I decided it was worth waking up at Zero Dark Thirty and turning my usually solitary exercise into a test of my abilities to run and be social at the same time. On a cold, gray Saturday morning, that was asking a lot. But there was another reason for my hesitation. The long run was actually comprised of three, shorter runs — a six-mile loop from the store out east to Highland Park and back, a second, seven-mile out-and-back southwest along the Genesee Greenway Trail, and a final, five-mile loop due south of the store along the Canal Trail then through the neighborhoods south of East River Road. Mathematically, the 6+7+5 loops = 18 miles, two more than I needed to go, which was fine. Yet I had always run my long runs in one, big run, not several small chunks. So, I kept asking myself, does it matter if you slice it up, or do the benefits of long runs only come if you run them in a single effort? Before my first foot hit the pavement, I was presented with my first challenge: which of the pace groups should I be running with? I felt like Goldilocks — I was too fast for the 9:30 group but too slow for the 9:00 group. In the end, I threw my sneakers in with the 9:00 group, figuring I was pushing everything else, so why not. Plus, my new friend from my Tuesday night speed workouts, Prem, was there. If all else went wrong, I figured, I’d at least have someone to talk to. Within seconds of starting, the second, and totally unanticipated, problem of the morning surfaced. Loop One, as Loop Three would turn out to be, was an urban route, which meant stopping at traffic junctions and paying more attention to cars than I usually have to on my rural solo jaunts. We stopped. We started. We ran too fast for me over the first two miles. We stopped again, and I caught my breath (thank God). But I didn’t catch my groove until mile five. By that time, we had run some more, we had stopped some more, but most problematic, we had passed some bushes (more on this later). Finally, we climbed the long, steady hill up Elmwood and circled back to the store. Pro: They’re called pace groups for a good reason. Con: Stopping and starting does not a good run make. True confession. On loop two, the 9:00 group started without me. But that was on me. And if you’re a loyal reader of this blog, you can probably figure out why. By the middle of the first loop, it was potty time. I had been dying to go since mile three, but I was in a group, and nipping off to the bushes would have been embarrassing, to say the least. So, after a bathroom/hydration/energy gel break, I was in with the six 9:30 group runners as they made their way out to the trails on the west side of the U of R campus. As it turned out, this loop was probably the best testimony of the day in favor of group long runs. The camaraderie helped me push through a couple of tough spots; the trails were fast and more conducive to focused running; and Frankie, our pace leader, listened to the needs of the smaller group and facilitated a faster pace, which was much more to my liking and closer to the pace I was hoping for. We were back to the store in no time. Pro: Running with others helps you push through the tough moments. Con: Pooping is easier on solo runs. Well, maybe a good runner, but definitely a lousy map reader. Now down to three — Frankie, Abby and yours truly — our diminishing 9:30 pace group got lost a couple of times. Not a big deal, especially as the company at this point was great. Frankie, I learned, was both a New York AND a Boston qualifier, and his stories about New York (“A way better marathon than Boston”) fueled my desire to run it more than you can imagine. I swear I ran the whole New York marathon in that five-mile loop. Pro: Group running with experienced runners? Priceless. Con: Make sure one of you has a map. Or bread crumbs. The Final Verdict: I’m still not sure how to process this, as there were too many variables. Running with others is certainly preferable to running alone. I cannot count the times I leeched off my fellow runner’s energy in order to supplement mine, or the times I learned something that I will put into my game plan for my upcoming training, for New York, or beyond. But running 18.5 miles in chunks? I don’t know what the sports scientists say, but I know that, by mid Saturday afternoon, I did not feel fatigued, and every muscle from my hip down was functional. This was in total contrast to my solo long runs, which have always been continuous and tiring, much more like race day itself. I’m not sure if that was a good thing or not. But I’ll let the following day’s run have the final word. A seven-mile shakedown run, I managed to run it at race pace — an easy 8:48. I wasn’t even trying, despite the fact that my legs felt like Bo Weinberg’s (look it up). The dead legs were, obviously, due to the previous day’s effort. But was the fast, easy pace due to the inconsistency of the previous day, too? All I know is, there’s just five more weeks — a mere 33 days — left to go. And when I cross the finish line, I will probably never know if this one run helped or hindered any more than any of the others. But somewhere during the 26.2 miles, you can be sure I will be thinking about that. Now on to week 12.